I have been busy creating my Christmas Unit so I haven't been doing much posting lately. My Christmas Unit is basically done now (I may post about that tomorrow!) so I thought I'd like to take a moment and share some classroom ideas from the past week or two. Sometimes I think I like variety and new challenges even more than the preschoolers. Here is one of the activities we set out this week. Colour sorting! We use buttons for a variety of activities. This is one way of setting up a colour sort that allows the children to practice their fine motor skills at the same time. 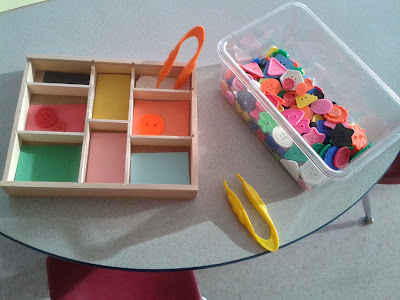 If you don't have a sorting tray, you can also use a muffin tin and just line the cups with round paper shapes. 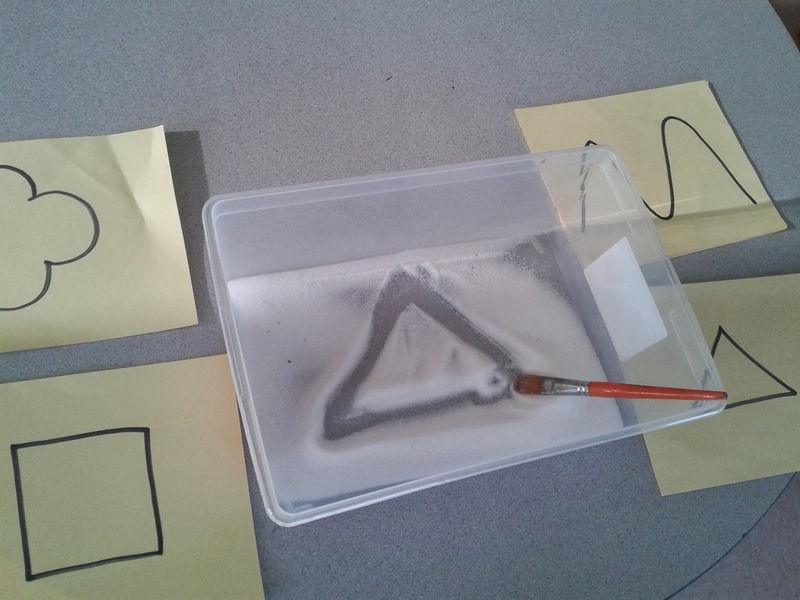 This center activity features a tray of salt and some "challenge cards." We started the students with the shape cards and then moved on to some trickier ABC cards. One day we also placed this salt tray on the light table to add another element of interest. Incorporating the light table was a fun idea, but one that I may not repeat. This activity can get a little messy. There's always one or two little dears that create their own game and start removing the salt from the bin and sprinkling it around the table. We'll see how our light table works the next time I turn it on! 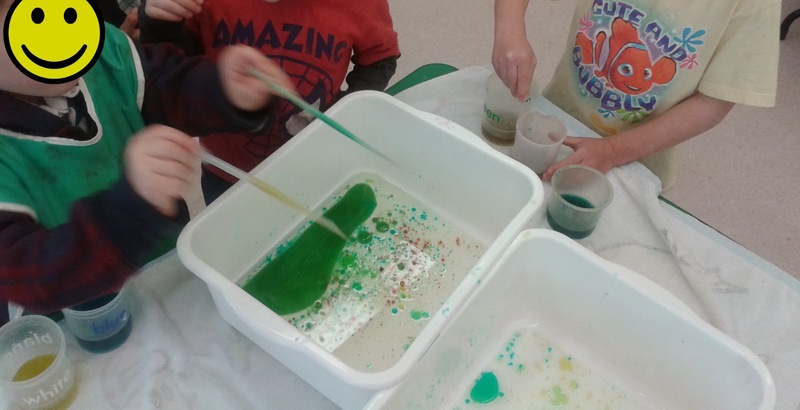 Here we have a fun activity that requires a thin layer of oil, droppers, and water tinted with food colouring. The children loved seeing the drops form in the oil and then watching the colours mix to create new colours. Their favourite part was towards the end when there was a grayish brown puddle in the bin. The class was delighted. "MUD!" Of course it was their favourite colour of all. Here is a picture of me and hubby out in some mud. 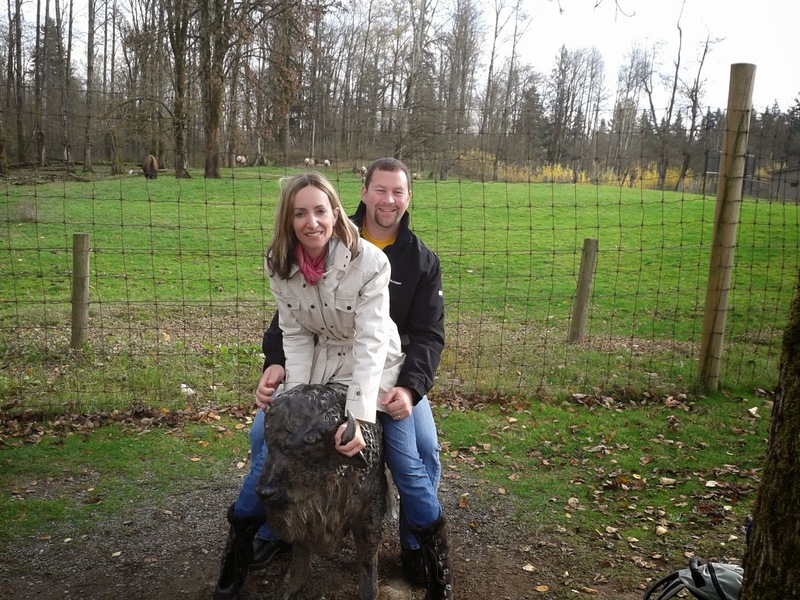 And "riding" a buffalo. Not really, but I'm including it to encourage all you hardworking parents and teachers out there to remember to take some time off for yourselves. I know I need reminders to do it more often myself. Balance = sanity!